Advance Lifts 3000 Series Dock Lift:. These are our medium sized Disappearing Dock lifts. 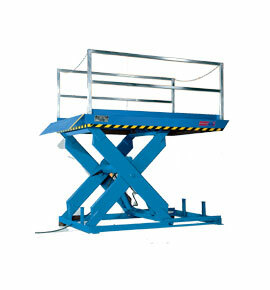 They are sized to handle pallet jacks, powered pallet jacks, straddle stackers and small fork trucks. They are also used for dock to ground access. • Axle Capacity Ends: 6,500 lbs. • Axle Capacity Sides: 5,000 lbs. • Platform Size: 6 x 8 ft.
• Lowered Height: 15 in. • Shipping Weight: 4,200 lbs.